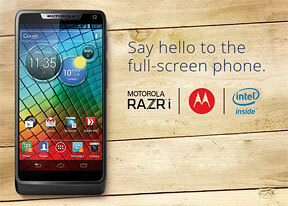 The Motorola RAZR i is basically a RAZR M with minor changes and, of course, the 2GHz Intel processor inside. Moto is playing to its strengths with the RAZR i, the build quality feels very solid thanks to the aluminum frame that goes around the screen and the familiar, grippy Kevlar coating on the back. The phone measures 8.3mm thick but Moto worked its magic and managed to fit a beefy 2000mAh battery inside. It should provide plenty of juice for the Atom CPU to run on. The front features a 4.3" SuperAMOLED Advanced edge-to-edge display with qHD (540 x 960) resolution), with Gorilla glass protecting it. It's not the sharpest display, but it is decently bright, with good image quality. Even though Motorola calls this an "edge-to-edge" display, there's actually some bezel here - it's just that it's way thinner than that of other smartphones. This also explains how Motorola managed to fit a 4.3" screen on a body that's hardly any bigger than the iPhone 5. One of the changes that Motorola and Intel made compared to the RAZR M is the hardware shutter key. It's a two-stage key and can be used to launch the camera - it starts up lighting quick! The Intel chipset manages to snap 10 photos in under a second. Other than that, the camera has an 8MP sensor and can shoot 1080p video. It's accompanied by a single-LED flash. The shutter key shares the right side of the phone with the traditional Power/Lock key and the volume rocker. On the left, there's a plastic flap that covers the microSIM and microSD card slots and a microUSB port. There's no microHDMI port this time, unfortunately. The top of the phone houses just the 3.5mm audio jack while the bottom holds nothing of much interest. As for the software, the Motorola RAZR i will be launching with Android 4.0 Ice Cream Sandwich in a month, but there's Jelly Bean in its future too (Intel has already ported it to the x86 architecture). The processor is a single-core Atom clocked at 2GHz with Hyper-threading (a technology that improves multithreaded performance even with a single CPU core). Performance seems great but we were curious to see how it performs against the dual-core Krait processor inside the RAZR M - you can find that out on the next page. App compatibility is another issue - neither Intel nor Motorola spoke too much about it, but you can bet most apps will work okay. Only apps that were developed with the NDK might pose a problem (this compiles the code to the processor's native instructions, but usually that means ARM and not x86 as Intel is a bit late to the party).